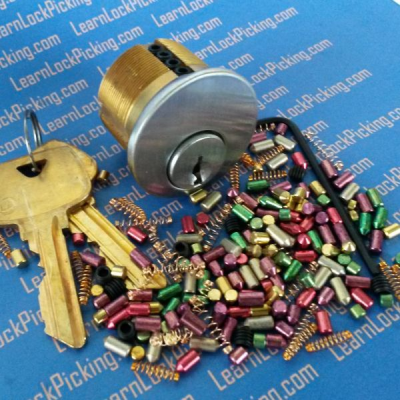 The 5 pin version of our lock picking practice locks. Pin stack retainer screws make it easy re-key this lock cylinder to thousands of different key combinations for thousands of different lock picking challenges. An assortment of extra bottom pins, top pins, master pins, and springs is included. SKU: 5-pin-UPL. Category: Practice Locks. Brands: LearnLockPicking. This is the 5 pin version of our lock picking practice locks. Re-keyable practice locks make it easy to learn and master the skill of lock picking. 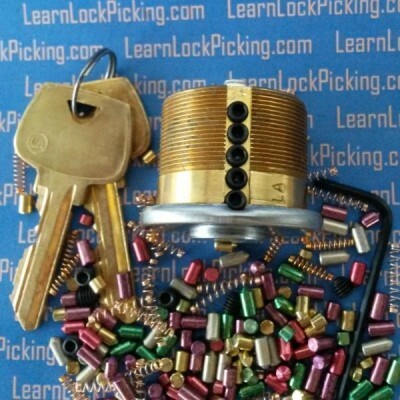 Our practice locks make it easy to learn because our pin stack retainer screws make it easy re-key this lock cylinder to thousands of different key combinations for thousands of different lock picking challenges. An assortment of extra bottom pins, top pins, master pins, and springs is included. This is the easiest way to learn lock picking. 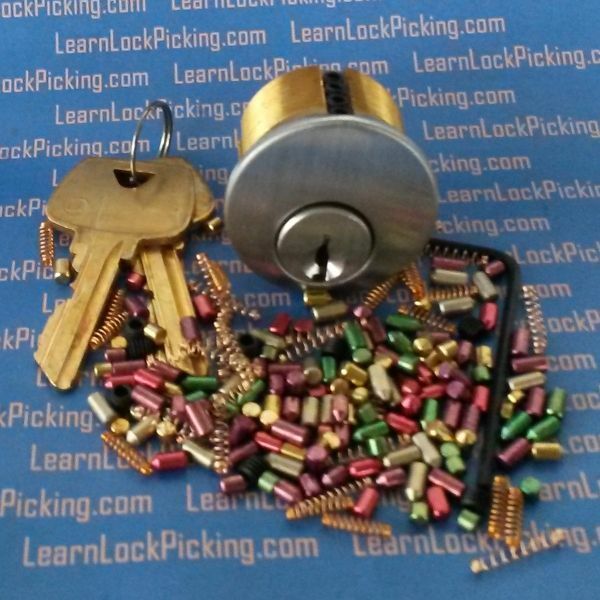 The beginning lock picker should empty the practice lock of all pins except for the first two stacks. Once you are proficient at picking a 2 pin cylinder, you can add a third, forth, and finally a 5th pin stack. 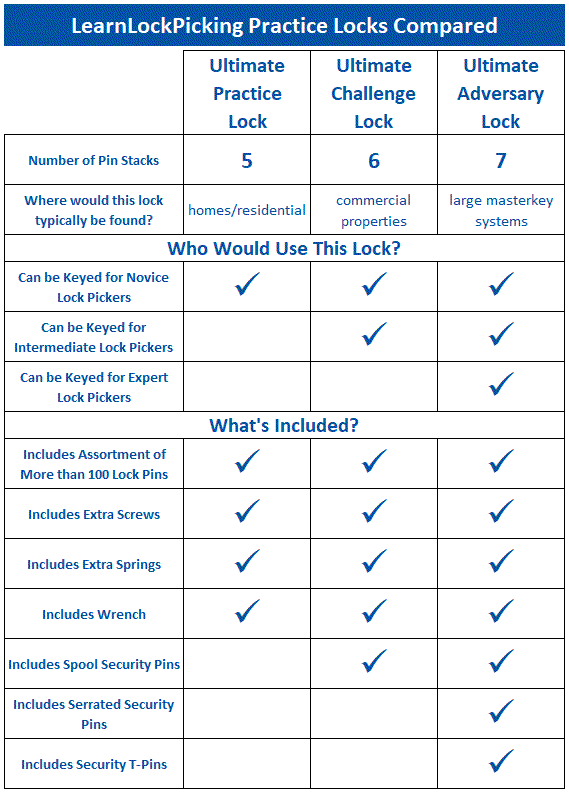 The selection of over 100 different pins included allow you to create a variety lock picking challenges. 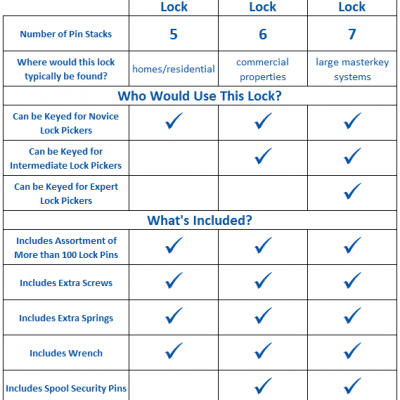 All Ultimate Practice Lock variations were invented right here and were the original products offered by LearnLockPicking.com. Today, thousands of our practice locks have been used to master the skill of lock picking in over 40 countries. For more information on our most popular products, you can visit our Ultimate Practice Lock page. It was exactly what my grandson wanted for his birthday. Along with his hug and thank you I got a lesson in how locks work. Win-win for both of us! A very good learning lock for beginners (like I am) and professionals. Easy to repin and the provided keys are a nice addition… I really enjoy it! This lock was exactly what I was looking for. Easy to repin. With security pens I can make this lock a little more challenging. I’m glad that I purchased it as a first practice lock. I recommend it to anyone getting into picking. This is a great training lock. It has an open keyway, so is good for learning about picking the pins. I also purchased a bag of advanced training pins, that also fit in the lock. I highly reccommend this lock for beginners. You can really learn a lot from it. Shipping was relatively quick and product was packaged with care. This lock functions perfectly and changing out the internal workings is a breeze. This is the perfect lock to learn and practice with whether you’re just starting out or you’re at a more intermediate level. Keep in mind, even if you’re more experienced, you can change out the pin stacks to any number of combinations using security pins (serrated or spool) making the challenge even greater. The only other thing I can suggest is that if you plan on holding this lock while picking, rather than putting it in a vice, because it’s only 5 pins it’s a bit harder to hold than something that would be longer (6 or 7 pin). That last fact of course has no bearing on the quality of the product, it’s more of a comfort tip. Anyway, I would definitely do business with this company again and likely will in the future. I bought this set for my daughter for Christmas. Here, in her words, is the review: I love it! It is so very easy to change the pins and it acts more like an actual door lock in terms of tension and resistance than what I had been using previously. I am looking forward to using this for quite some time. I’ve had this lock for over a year now and I still use it daily to practice picking new pinning combos. Excellent tool and tough as nails. An amazing product!!! So happy with it on every level. It is very easy to change the pins, it is tough (i lost a spring in it and it cut the spring in half and still functions great!). It’s versatility has been an enormous help in advancing my lockpicking skills. A must have for any lockpicker.